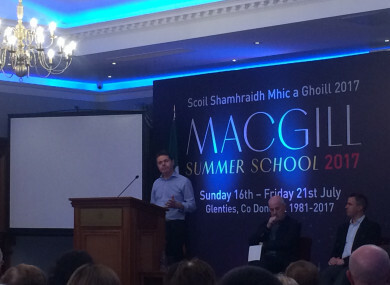 Minister Paschal Donohoe speaking at the MacGill Summer School in Glenties. WITH THE DÁIL in recess, politicians, academics and commentators from across Irish society found themselves at a bit of a loose end this week. With a need to still talk about the world’s big issues – and some of the smaller ones too – they ended up in the picturesque village of Glenties in Co Donegal to attend the annual MacGill Summer School. For the past 37 years, organiser Joe Mulholland has attracted the big names – including the new Finance and Public Expenditure Minister Paschal Donohoe, who spoke tonight about topics ranging from his love of U2 (in the context of Brexit, of course) to his disdain for left-wing politics. In a speech, the Fine Gael minister strongly criticised left-wing politics, which, he said, would “break this country”. He said that a ‘social disorder’ has prevailed since the 2008 economic collapse, and that centrist politics were now vitally important. “The policies of the far left – profligate spending, higher taxes on businesses, ‘let someone else pay for it’ – would all break this country,” he told the audience. But the centre holding is not, in itself, enough. The centre must also regenerate – because a static political equilibrium in a changing world is not tenable. Donohoe, who said he will be attending U2′s Croke Park gig this Saturday, quoted track six of the Joshua Tree album to a packed-out room in the Highland Hotel in Glenties, Donegal, which he said illustrated his point. Red Hill Mining Town is rarely played live, but the minister said it tells the story of the closure of the coal mines in mid-1980s Britain. In doing so, it also tells the story of the social and political consequences of the wholesale withdrawal of a major industry and source of jobs from communities in many parts of England and Wales. The song is steeped in a sense of abandonment, said Donohoe, who added that it is that feeling of abandonment that is now one that is familiar to many in the US and the UK who voted for Donald Trump and Brexit respectively last year. The minister told the crowd in Donegal that Ireland has many problems, some of which are deeply ingrained in communities. “In politics, it is easy to blame globalisation for these problems. But we in the political centre must resist that. Ireland is best placed to have this debate, said the minister, highlighting that as a small country, we are open to globalisation and we “reach out to the world” exporting “everything from Botox to TicTacs”. Talking about the double whammy of the election of Trump and the Brexit vote may present challenges to Ireland’s economy, Donohoe said he remembers the day he heard about the UK’s vote to leave to European Union. I remember feeling this in the most acute way when I went to wake up my children on the morning of the Brexit result and thinking, for the first time, that they may not live under the same institutions and enjoy the same freedoms as I did growing up. Finishing how he began, he concluded by quoting two more songs – this time, from the late, great Johnny Cash. An artist given a new audience in later years when he covered One [by U2] and an apt person for a Minister for Finance to quote, I hope you agree. “Not bad advice,” concluded Donohoe. Email “Fine Gael minister says left-wing policies would "break this country"”. Feedback on “Fine Gael minister says left-wing policies would "break this country"”.